1. Ok so I do remember the fact that on my card it said that I should have gotten the Instant Bronzer Gel sample but in fact I got the Eden Natural Nail Polish Remover. I was excited to try this as I paint my nails practically every day so I thought this would be a nice thing to try! I've never been more disappointed by a product in my life. Ok ok, this is a slight lie..I wasn't really expecting much to be honest but it really was just awful! It didn't remove my nail polish very well (I had to use quite a bit to remove just the stuff on my thumb nail) and it made the cotton wool pad squeak on my nail UGH!! Would not buy the full size of this at all. 4. Miners Cosmetics Love Phat Liner in Black - I have so many eyeliners that I really didn't need another to be honest. I tried this and it was ok, but I wouldn't have picked it from the shelf myself. I found the line it left was too big for me and it transferred quite easily to the top of my eyelid. Not a huge fan of the pigmentation either really. 5. Murad Time Release Blemish Cleanser - This actually says something like "step 1" on the product, which I find a tad annoying as I feel like you can't really get a good representation of the cleanser if you aren't following it with the right product after. Anyway, this one is really for people who get quite a few blemishes from what I can gather.....which isn't how I'd describe my skin. I've currently got a few stress spots but nothing drastic so I was a bit worried about using this. I'm fairly sure it was a little bit of a culprit for bringing me out in a few blemishes and for also drying my skin out a bit too. Needless to say, I stopped using this pretty quickly and wouldn't buy the full size. 6. Stylfile S-File - This is apparently an invention by someone on the apprentice, who thinks that because our nails are curved then we should use a curved file. Most of my nails naturally grow to a squared off end so not sure how this would have helped me really. I'll be honest I have SO many nail files (that are square...) that I am incredibly competent and comfortable with , that I really didn't need this. I gave it to my Mum, as she's always losing her nail files, and she used it once and sent me a text saying "....this nail file is weird. How am I suppose to use it?! Also where is the bit to make my nails shiny??" Haha! I know some people absolutely loved having this in their box, but for me it was a dud and I wouldn't have picked it up off the shelf. 2. Balance Me Rose Otto Intensive Lip Salve - Balance Me really do seem to be in almost every beauty box I've ever had from any brand ever. I really liked the body wash that I got in my Jolie Box (when they did the "full size items" box) and would happily use that again, but I didn't get on with this at all. I have a rose scented lip balm already by Rose & Co Apothecary (it's one of those "all round balms" actually, which is super handy in my bag as I get quite dry hands during the day and this is amazing on them to stop them cracking (gross right??)) I think I got this in a Jolie Box too actually... Anyway, my main issue with this was the tingling that seemed to last forever and was actually quite painful on my lips. Not a fan at all. However, one of my colleagues is so she now has a lovely new lip salve for her handbag, which she is apparently obsessed with. 3. Redken Color Extend Radient-10 - I'm assuming that this isn't an English product from the way that the word "colour" is spelt, so I'd never heard of this brand before getting this sample. I do dye my hair (I have ridiculously weird natural hair colour!) so I thought this would be nice to try. It smells nice and I think it does make my hair look a bit darker like the hair colourant I put on it.....when I actually remember to put it on. This is my main issue with any hair product...if it doesn't go on after drying to specifically make my hair stay in place, I will forget to use it! I'm going to try leaving it on my desk so that I see it every morning and will hopefully remember to use it! 4. Nails Inc Nail Polish in Belgrave Place - This was a 4ml little bottle, which was quite cute really. However, my anger over the hype surrounding Nails Inc polishes is well known to everyone who knows me really....I resent paying £11 for a polish that doesn't last and really isn't anything special at all really. I've never found a colour and gone "ohmygodIneedthatinmylife!!!" (Unlike the Urban Decay ones, which I am in love with and will do a blog post about them soon!) I just think they aren't very good and this sample did nothing to change my mind. Despite using all the usual base/top coats etc this one had chipped by the end of the day...and I have other polishes that are the same shade (I'm known at work for being able to reel off cheaper alternatives to most high end nail polishes!) I've never actually brought any Nails Inc polishes and have only had ones from magazines and beauty boxes, but I wouldn't buy them from the quality of these samples. For a nail polish addict, I seriously resent paying over £5 for something that won't be on for ages. Also I don't get the Essie thing either. I feel like I'll lose followers by ranting about these two brands but that's fine. Everyone has a right to their opinion on nail polish brands and just don't like Nails Inc or get Essie (I look at the stand and think "wow.....these look boring." I'm weird like that you see...) Anyway, it was nice to have a nail polish but a) it would've been nicer if it was full size and b) if it was a different brand. Nails Inc is frequently on offer with magazines etc so I would've liked to have tried a different brand that I'd maybe never heard of. I know loads of people will have loved this though so it's only me that's a miserable grouch! 5. Papier Poudre - This was a 20 sheet booklet of blotting papers. I'd never used them before so it was interesting (and a little gross) but I wasn't hugely impressed/couldn't see me actually remembering to use them. Again, one of my colleagues loves blotting papers so she benefited from these! 6. White Glo Professional Choice Toothpaste - This was in my very first Carmine box too and is actually the first sample from a beauty box that I went out and brought as a full size from Boots! I love this toothpaste and did see a difference using it! I loe that this was in the August box as I like having toothpaste samples for "just incase" (I'm crap at remembering to buy toothpaste!) I know a lot of people were a bit like "huh??" but to me it totally makes sense. Most people who are into beauty are also on a quest to have perfect "Hollywood" teeth too. I personally would LOVE to try some teeth whitening strips! I liked this product, and having already used it before, was happy to find it nestled in my SSB box! Verdict - I quite liked this box as it was more of a mix of products and not just focused on one bit (like skincare...) Still not my favourite box so far but not a bad box at all. If I wasn't such a fussy/forgetful person I would have used everything in this box for sure! 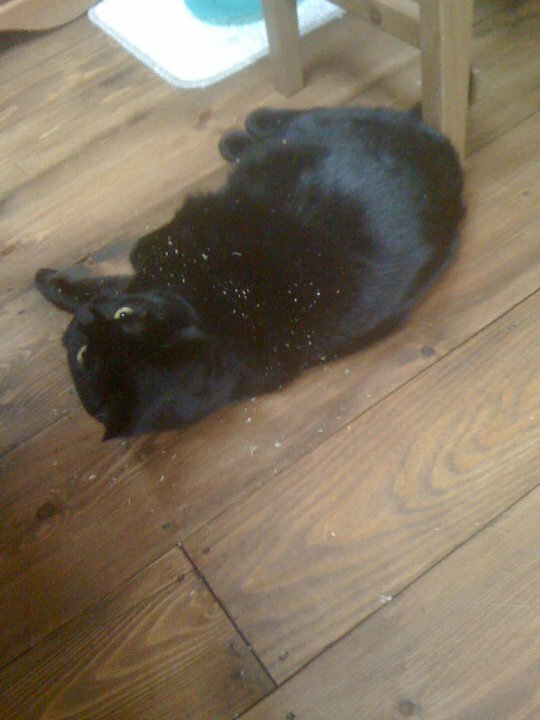 JD with dried catnip all over her at Christmas. She loves to roll around in it and then dribble everywhere. She's a little bit special like that you see. 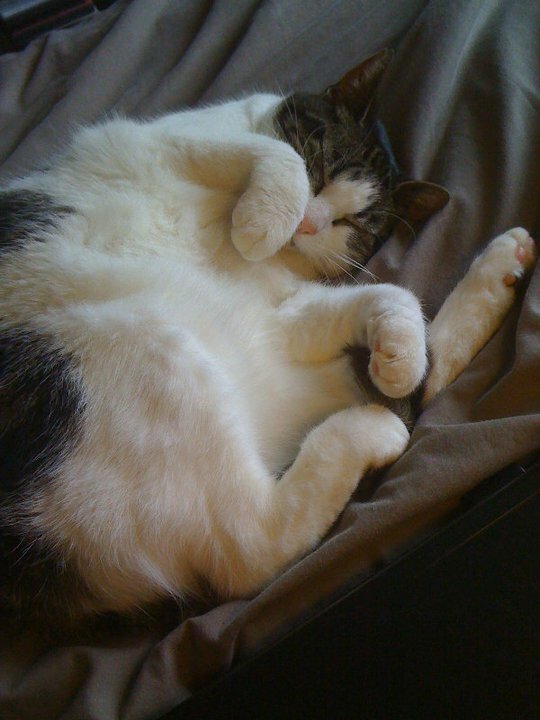 Mollie loves to sleep awkwardly...but she looks like an anime cat so I forgive her! Plus her chest fur is SO freaking soft!